Some species of dogs are experts when it comes to jumping. Are you a dog owner? Do you have a fence around the perimeter of your property? Fences are an excellent addition to practically any landscape. In addition to providing homeowners with privacy, security, and aesthetic appeal, they are also one of the best ways to contain pets in your yard. 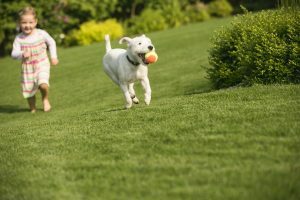 If are in need of a fence for your property because you are a dog owner, here are a few important considerations. Can Your Dog Jump Or Climb? Some species of dogs are experts when it comes to jumping. For example, boxers and labs are known for being excellent jumpers. They have been known to leap over medium size fences with ease. If you have a dog that can jump high, you want to install a fence that is at least five feet high (preferably closer to six feet). You also need to take into consideration your dogs climbing abilities as well. If you know your dog has climbing abilities, you need to take that into consideration with your fence selection. You may want to stay away from fences that could be easy for a dog to scale if they had a running start. You have more freedom in your fence selection if your dog is small. This is because bigger dogs are far harder to maintain than bigger dogs. If you have a bigger dog, you need to choose a durable fence material. However, if your dog is smaller, you need to consider the spacing between the railings within your fence. Does your dog get excited at the sight of things? There are plenty of dogs that bark at anything that moves. If your dog barks when they see the mailman, a squirrel, or the neighbors, you may need to invest in a privacy fence for the perimeter of your property. Chain link fences are great for keeping dogs contained in your yard; however, they provide your dog with excellent visibility. This entry was posted on Thursday, July 19th, 2018 at 9:29 am. Both comments and pings are currently closed.